The festival of San Fermín is held annually from 6 July to 14 July in the city of Pamplona in northern Spain.The most famous event in this festival is the running of the bulls, that is also called the Encierro. A San Fermín pedimos, por ser nuestro patrón, nos guíe en el encierro, dándonos su bendición. ("We ask San Fermín, as our Patron, to guide us through the Bull Run, giving us his blessing.") 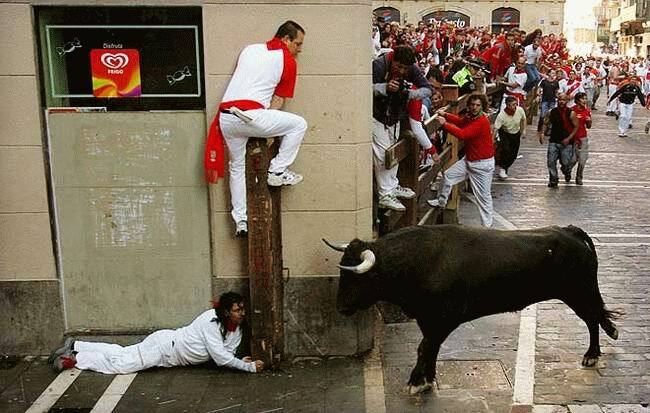 - Anyone who survives a close encounter with panicky bull is said to have been protected by San Fermin's cloak.Here are some useful tips if you want to attend to the bull run.